The California Prostate Cancer Coalition (CPCC) is a coalition of doctors, prostate cancer survivors (and families), nurses, support groups and others concerned about prostate cancer in California. In this website, we have attempted to answer some of the many questions you might have regarding prostate cancer. What is Prostate Cancer? What do I need to know about Prostate Cancer? I have been diagnosed with prostate cancer; now what do I do? Much has been written on the subject of prostate cancer including medical articles, research reports, and feature news articles. These have addressed prostate cancer occurrence among the male populations, research toward a cure, prostate cancer screening, prostate cancer treatment, and prostate cancer survival. 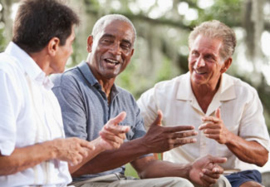 This site provides resources on all of these prostate cancer considerations. Our goal is help you get the answers to your questions so you can make informed decisions about prostate cancer. Disseminate information relating to prostate cancer. Advocate for prostate cancer legislation and funding. Perform outreach to and involve all communities. Overcome barriers to proper care and treatment. John Claster Former President of Claster Television, Inc.